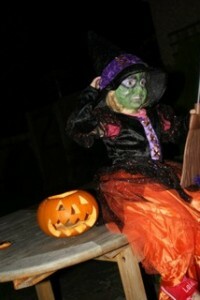 You are at:Home»Events»Halloween: Trick or Treat? I’m not quite sure how I feel about Halloween. It appears that it is becoming an increasingly important event on the calendar. I find it quite fun, but at the same time fairly pointless and a bit of a waste of money. The shops have been full of sweets and costumes for ages; Sofia absolutely loves it and has been talking about it for some weeks due to the commercial onslaught (though she has been talking about her birthday, Christmas and Easter this week also). It definitely doesn’t seem to have much to do with the eve of the feast of All Hallows (or All Saints). My husband Matt loves Halloween, so in our house it does have a lot to do with sweets, trick or treaters and fancy dress costumes. Matt, I think, would have been a make-up artist in another life. He loves getting out the Snazaroo face paints to make up Sofia, so he goes to town at Halloween. 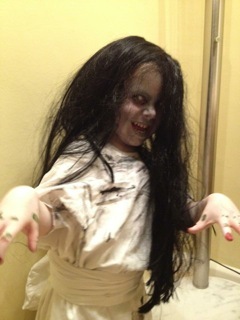 Sofia greeted trick or treaters at our door last year dressed as Samara from The Ring and they were genuinely scared when they saw her. He painted her face, bought the wig, found the white sheets in a charity shop (and then stained them) and even put the fake blood on her nails. I’m not completely convinced that it was suitable for a nearly four-year-old, but Sofia was delighted with the results and the reactions she got! We’ll definitely be buying the pumpkins, outfits, and sweets for our trick or treating visitors again this year, but I’m still not totally sold on the whole idea. Over on Expedia’s blog, I’m talking all things spooky and The Langham Hotel, which is reputed to be the most haunted hotel in England.